Skeletal dysplasia 2 (SD2) is an inherited disease of collagen resulting in disproportionate dwarfism in the Labrador. Disproportionate dwarfism is marked by abnormal size discrepancies between the limb length of affected individuals and the size of their torso. In the case of SD2, the limbs of affected dogs tend to be shorter than normal despite an average sized torso. International breed standards of the Labrador list shoulder heights of 56-57 cm in males and 54-56 cm in females. In the publication describing the COL11A2 gene mutation associated with SD2, the authors found that most of the affected males had shoulder heights of less than 55 cm and most affected females showed heights of less than 50 cm. However, there is some overlap of shoulder heights between those of normal dogs from blood lines of smaller size and affected dogs from larger sized blood lines. Though the front limbs tend to be more severely affected (and sometimes slightly bowed) with SD2, the long bones of both the front and hind limbs can be shorter than normal. SD2 affected dogs do not appear to develop joint problems with this condition (e.g. early-onset arthritis) as a result of their abnormal conformation like dogs with other skeletal disorders. 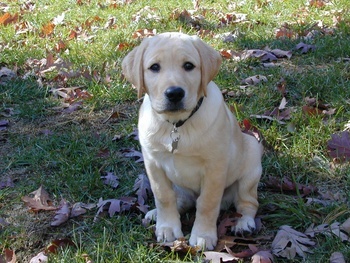 However, if hoping to breed for large working Labs, this mutation could hinder these efforts. This disease is inherited in a recessive fashion with incomplete penetrance (see “How Are These Diseases Inherited” section below). In the same study that described the SD2 associated mutation, the authors traced the pedigree of affected dogs back to a single popular sire from a blood line of working Labradors. Due to this history, it is expected that the majority of affected dogs would come from field/working lines rather than show lines. Similar to SD2, retinal dysplasia/oculoskeletal dysplasia 1 (RD/OSD1) is a genetic disease of collagen resulting in dwarfism. However, the clinical signs of RD/OSD1 are much more severe than those seen in SD2 affected dogs. Dogs affected with RD/OSD1 are typically identified before 2 months of age with a combination of marked skeletal malformation (particularly in the front limbs) and vision deficits. As these puppies grow, forelimb dwarfism becomes evident and the forelimbs become severely bowed resulting in abnormal joint development of the elbow putting dogs at risk for early-onset arthritis. Owners of affected dogs may also notice abnormal, dome-shaped skulls. Affected dogs also display ocular abnormalities ranging from mild to severe. Abnormal development of the retina, retinal detachment, and cataracts are common and frequently result in blindness or severe vision deficits. Unfortunately, there is no cure for RD/OSD1. Carriers of the COL9A3 gene mutation associated with RD/OSD1 (dogs inheriting one copy of the mutation from a single parent) do not show the characteristic severity of skeletal and ocular abnormalities of affected dogs. However some (but not all) carriers develop mild abnormalities of the retina including retinal folds and may have mild vision deficits. In order to produce pups free of ANY abnormalities related to this mutation, it would be important to only breed dogs that have not inherited the mutation. Labradors that have retinal folds on eye exam cannot be certified by CHIC (Canine Health Information Center) until they have tested normal for the RD/OSD 1 mutation. At this time, retinal folds in Labradors free of the RD/OSD1 mutation are considered benign and are not believed to be inherited. Both of the diseases discussed in this blog are inherited in a recessive fashion meaning that a dog must inherit two copies of the genetic mutation (one from each parent) in order to develop the disease. Dogs inheriting a single copy from one parent are considered carriers. Other than the retinal folds seen in RD/OSD1 carriers, carrier dogs will not show clinical signs of these diseases, but can produce affected puppies if bred with another carrier of the same mutation. In addition, the mutation associated with SD2 displays incomplete penetrance meaning that not every dog inheriting two copies of the associated mutation will develop signs of SD2.